We are one of Ireland's leading business, accounting and taxation advisors. We provide practical support and solutions to assist our clients to manage and develop their businesses in Ireland and internationally. At JPA Brenson Lawlor we over have four decades of experience in providing business assurance and audit services to owner managed and family businesses. Our tax department provides a full range of tax services to both companies and individuals. Changes in Irish Company law have led to additional responsibilities and an increasingly complex role for both company directors and secretaries. The McCabe Group are very happy to be associated with JPA Brenson Lawlor, its partners and staff. I met Padraic shortly after I completed my “Pre-Reg”. Padraic worked with me in relation to all aspects of my first pharmacy acquisition, Meaghers of Baggot Street. 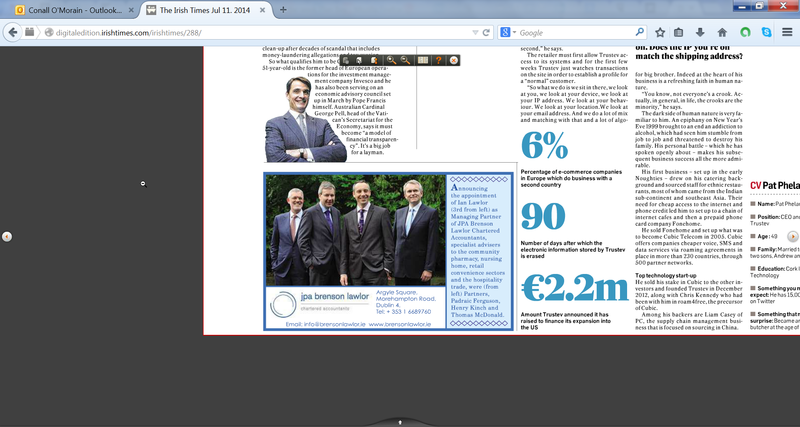 JPA Brenson Lawlor have been our audiors and advisers to Dublin Simon for many years. During this time they have helped and supported us with both financial and non financial matters and have provided us with invaluable advice and support. JPA Brenson Lawlors auditor over many years and have always provided us with an excellent service. Their approach from start to finish is very efficient. JPA Brenson Lawlor has advised me over the past 10 years and look after all my compliance requirements - they have always been prepared to go the extra mile for me.